It’s always a joy to find a movie that is singular in its originality and surprising in its widespread appeal. Chicken Run is just such a film. Released in 2000, a year that also brought us Dinosaur and Titan A.E., animated films that should have been groundbreaking and memorable, it was instead Great Britain’s Aardman Animations that ruled the roost with this unexpected breakaway hit. As a rule, stop motion animation was rarely successful in feature film format. Though Disney and director Henry Selick managed to strike a chord in 1993 with The Nightmare Before Christmas, the technique was generally too complex and overwhelming to sustain an entire movie. Even so, Aardman had developed quite a reputation in the field with Academy Award® winning shorts such as Creature Comforts, The Wrong Trousers and A Close Shave. Despite the fact that Aardman Animations had been previously well-known in Great Britain for television characters such as Morph and studio namesake Aardman, it was director Nick Park’s trio of Wallace and Gromit featurettes that finally gave the little studio real attention in North America. The characteristic that is shared by all their creations? These animated characters transcend age and appeal to a widely ranging demographic. It was only a short matter of time before the creative minds at Aardman realized that they had a full-length film in them somewhere, it was just a matter of finding the right project. Numerous ideas were bandied about, including a Wallace and Gromit movie, but the idea to which the staff kept returning was about chickens who want to escape their farm. Park had been sketching out the details over time, and ultimately, it was this concept that Aardman took to the recently formed DreamWorks, an at-the-time fledgling studio headed up by Jeffrey Katzenberg, David Geffen and Steven Spielberg. The trio loved what they saw, and the issue of financing was solved. Park and his compatriot Peter Lord were able to make the movie they wanted, and despite questions about the viability of “clay” animating feathered creatures, the final result was a picture that was not only one of the top animated features ever, but also among the best movies of 2000. The reasons for Chicken Run’s success are manifold. In a time when traditional cel-shaded animation was becoming somewhat blasé, the challenge for studios was to find new and unique ways of making the product appealing. As a result, Pixar easily broke into the forefront with their CGI movies that combined awe-inspiring graphics and special effects along with fantastic story. 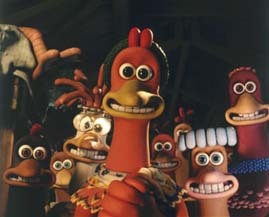 With originality in animation almost a requirement, the stop motion animation in Chicken Run did indeed feel new and fresh even though the technique goes back decades. The movie looks terrific; it is awash in color, full of characters with expressive faces, and culminates with a mechanical contraption that is elegant in its simplicity. It wasn’t only the style of the film that seemed novel, though. Chicken Run was full of fascinating characters who just happened to be dealing with rather adult problems. Questions of freedom, individuality, loyalty and even romance are important elements of the film’s plot, meaning that Chicken Run was a movie that children could enjoy for its surface humor and quirky characters, but adults would also love for its innate cleverness. Though the British accents are occasionally hard for some folks on this side of the Atlantic to understand (a point that is even humorously driven home as a little aside during the movie), the voice actors are outstanding. Primary amongst these are Julia Sawalha (of the BBC series Absolutely Fabulous) as Ginger, the always-delicious Miranda Richardson as the insidious Mrs. Tweedy, and Mel Gibson as the American expatriate chicken Rocky Rhodes. Since Gibson plays the American here, a lot of humor is actually at his expense, with clever asides about his “real” nationality and jabs at his action flicks. Notable supporting characters include Lynn Ferguson’s nearly incomprehensible Scots chicken Mac, Jane Horrocks’ ditzy Babs, and especially Timothy Spall and Phil Daniels as a pair of scavenging rats named Nich and Fetcher. An added special touch for movie buffs are numerous references to classic films. Since Chicken Run is at its heart a spoof on prison escape movies, it only makes sense that there would be allusions to The Great Escape, Stalag 17 and Papillon. Chicken Run takes place in Coop 17, and Ginger mimics Steve McQueen in The Great Escape by bouncing a ball against the wall of her solitary confinement cell. Other fan favorites receive nods as well, from the Raiders of the Lost Ark homage during the pie machine escape to the Star Trek tribute during the flying breakout that draws the movie to its climax. Back to the Future, Star Wars, and Mission: Impossible also get the Chicken treatment. All of these distinctive qualities give Chicken Run a deep intelligence that is uncommon in so many of today’s animated offerings, making the movie a true example of how animation can be appreciated by people of all ages. Both Aardman Animations and their creations are examples of how the unlikeliest heroes can accomplish big, big things.